Globally recognized hair care company, Advanced Beauty Care Inc has added a new label, CurlyChic Hair Care under its umbrella of top-selling mixed texture hair care brands. Dedicated to celebrating curl diversity, CurlyChic Hair Care designs and provides revolutionary products that afford teens and adults the chance to set their curls free. When cared for with CurlyChic Hair Care, these curls are extremely nourished, defined, and lush. “For decades, beauty and fashion campaigns have been synonymous with promoting long, sleek, and chemically-processed straight hair - CurlyChic hair can be all curl types and textures. We are excited to unveil our new campaign with a focus on lush, natural, beautiful curls” said Sandy Williams, Social Engagement Director of CurlyKids and CurlyChic Hair Care brands. The CurlyChic Hair Care brand is already garnering buzz within the beauty and naturally curly hair communities. Customer and influencer favorites thus far include CurlyChic Your Curls Conditioned, CurlyChic Your Curling Custard, CurlyChic Mane Moisturizer Curly Creme Vitalizer. 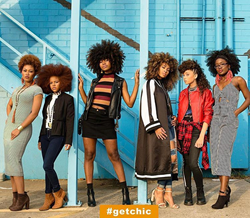 CurlyChic Hair Care is quickly establishing a position as the go-to solution for the unique needs of mixed-texture curly hair.